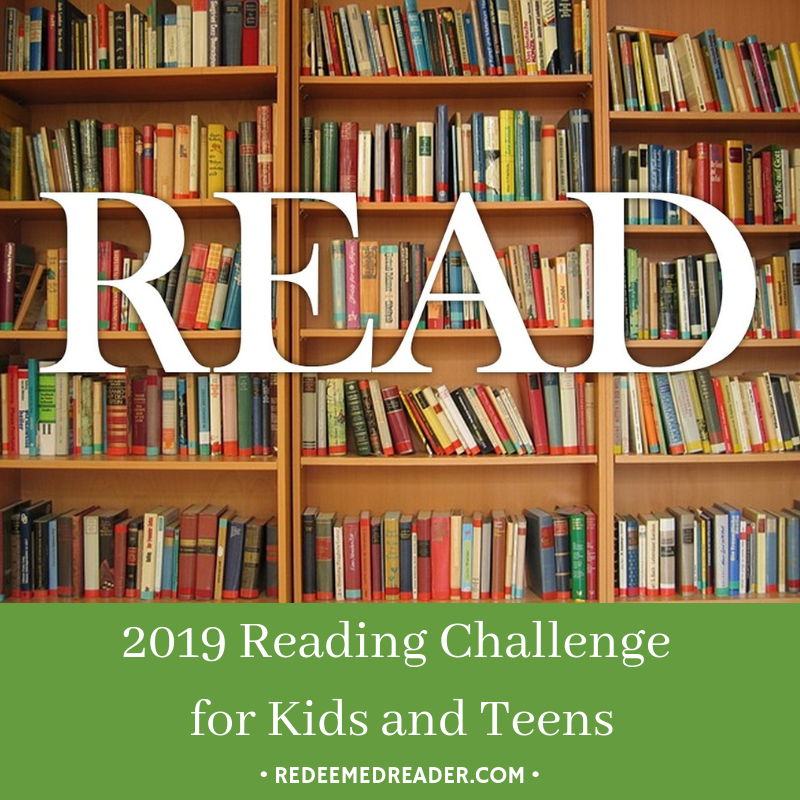 Did you take part in the Redeemed Reader Reading Challenge this year? We’re one quarter of the way through the year, and it’s time to check-in. How are you doing? Is there a category that you’re having a hard time finding books for? Have you already finished a category? I surveyed myself and my kids with the following questions–try them on your own kids or students as a way to check-in. Let us know in the comments if there are categories you’re stumped by! What Reading Challenge level are you attempting? Betsy: 47 (~1/2 through, ahead of schedule; remember, picture books count, too! )Daughter: 21 (~1/4 through, right on target! )Twin-A: 13 (~1/2 through, ahead of schedule! )Twin-B: 10 (~1/3 through, right on target! )Which book(s) have you enjoyed most this year (so far)? Betsy: The Wednesday Wars and The Vanderbeekers to the Rescue (not published yet; I was privileged to get an advance copy, and it’s terrific! )Daughter: The Wednesday WarsTwin-A: The Mysterious Benedict SocietyTwin-B: Watership DownWhich book has surprised you the most this year (so far)? Maybe a book you thought you wouldn’t like, or a book from a category you don’t normally choose, or a book you thought you’d love, but hated. Betsy: Dracula; “Honestly, it has a strong start and a reasonable finish. But the middle is a bit draggy….”Daughter: In the Days of Queen Victoria (Tappan); “I don’t normally enjoy biographies, but I have really enjoyed this one.”Twin-A: The Hound of the Baskervilles; “normally we guess the solution, but this one surprised me.”Twin-B: Watership Down; “I didn’t expect it to be rabbits and completely their perspective. It’s fun because it’s got its own tales and history. It’s got these tales of this one guy who’s mentioned a lot.”Which category have you read the most from so far? Betsy: NonfictionDaughter: “New Books” and “Fantasy” are tied.Twin-A: MysteryTwin-B: FantasyWhich category have you read the least from so far? Betsy: Book of Your Choice (then I can fit in all the books I’ve read but haven’t found a good place for on the list yet! )Daughter: Book of Your Choice (same as Twin-B)Twin-A: Book of Your Choice (easiest; “if you have one more book to read at the end of the year, you can read pretty much anything, like a comic book that just takes a few minutes”)Twin-B: Book of Your Choice (all of the above)Are there particular books you’re planning to read and looking forward to? Betsy: Hidden Figures, The Wright Brothers (McCullough), To Kill a Mockingbird (re-read), Courage Has No Color, The Hiding Place (re-read)Daughter: “Aside from my yearly Lord of the Rings re-read, I want to read a biography of J. R. R. Tolkien.”Twin-A: Mysterious Benedict Society and the Prisoner’s DilemmaTwin-B: The Pushcart WarAny last thoughts from the peanut gallery? Betsy: I’ve got several “books about books” on my nightstand this year, and all three discuss (or, at least, mention) lots of other books–perfect for the “books recommended in another book” category: I’d Rather Be Reading by Anne Bogel (fun, light read), Book Girl by Sarah Clarkson (a bibliographic memoir, of sorts), and On Reading Well by Karen Swallow Prior (an analysis of key classic works in light of virtue). I also recommend Honey for a Child’s Heart for great kids’ book lists!Daughter: “The series that starts with The Book Scavenger has LOTS of “books recommended in another book.” Some of the titles I’ve seen in that series are Tom Sawyer, A Swiftly Tilting Planet (I’m reading this one for this category), Greenglass House, “Goldbug” by Edgar Allen Poe, the Harry Potter books, Seabiscuit, The Book Thief, The Great Greene Heist, and lots more.” Twin-A: “I’m going to upgrade to the next challenge level since I think I can do it.”Twin-B: “Mom, can I upgrade to the next challenge level already? I’m almost done with several other books.”How are YOU doing in your reading challenge? Let us know in the comments! The post Reading Challenge Check-In (Spring): How Are You Doing? appeared first on Redeemed Reader.